You can do shiatsu self massage to help relieve stress and tension and maintain your physical and mental well being. Shiatsu is a Japanese type of bodywork that incorporates anma (Japanese traditional massage), acupressure, stretching, and Western massage. Try the following shiatsu sequence on yourself. Use the techniques you like two or three times a day. Use your thumbs, fingers, or knuckles as directed. Important: If any of these techniques cause pain, stop doing them. Holding one foot, press your thumbs into the center of the ball of your foot for a few seconds. Next, vigorously rub your knuckles across the entire sole of the foot. Repeat on the other foot. Place the the knuckles of your hands along the sides of the spine. Slide your knuckles up and down from your lower back to as high as you can reach. Interlace your fingers on the back of your neck and point your elbows forward. Gently squeeze your palms into your neck, but do NOT pull the neck forward. Squeeze five times or more. Rub your hands together vigorously. Then briskly rub the palms up and down on your cheeks. Briskly rub the sides of your nose. Beginning at the center of the area above the upper lip, use the pad of your thumbs or fingers to press and release every one-half inch until your reach the corner of the lips. Repeat on the area below the lips. For anxiety, use your fingertips or knuckles to drum lightly across the entire skull. For mental clarity, stick your index fingers in your ears. Twist them back and forth, applying a slight pressure. For vitality, squeeze one arm with your fingers. Move up and down the entire arm and repeat on the other side. 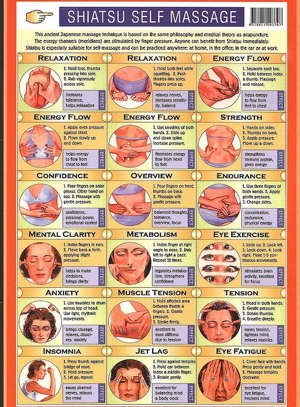 Download PDF containing the shiatsu self massage chart.